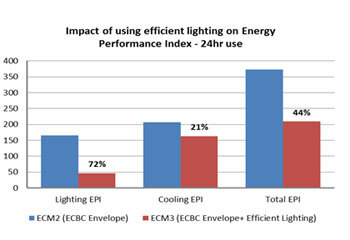 This section showcases the energy conservation measures in a building with ECBC envelope with efficient lighting design case. The Energy Conservation Measures considered here are ECBC compliant wall, roof, and window, efficient lighting with Daylight integration, and optimum Window Wall Ratio (WWR). 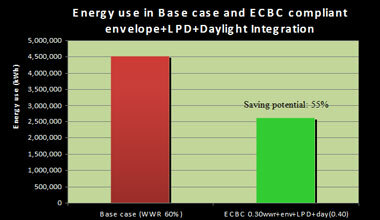 Although there is an energy saving potential from individual ECBC wall, roof, and window, efficient lighting; the overall energy saving potential from the ECBC envelope + efficient as a whole strategies are mentioned below. It is noted that adopting ECBC measures, the energy saving potential in a day use building is less than that in a 24 hour use building. 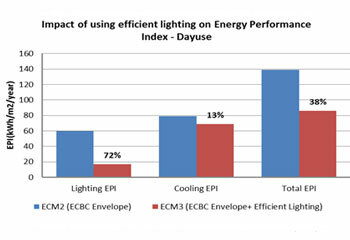 From the graph below it is also observed that by just using efficient lighting (lower LPD) there is 38.6% reduction in the EPI for day use buildings and 47.6% for 24-hour use buildings. 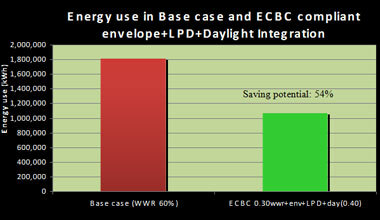 The Life Cycle Cost Analysis (LCC) of this ECBC envelope + efficient lighting with daylight integration and 0.3WWR was carried out under this project. The LCC for a day-use building of this case considering 25 years is 747 Million rupees. The Pay back for incorporating the above strategies is found out to be less than three years. The LCC for a 24 hour-use building of this case, considering 25 years is 2141 Million rupees. The Pay back for incorporating the solar passive design strategies is found out to be one year.